Pawan Kalyan fans in Melbourne seem to be the loudest, the most enthusiastic and to prefer shredding rather than recycling their newspapers. The air was full of strips of paper right from the opening moments of Gabbar Singh and the paper storm continued well into the second half. A packed cinema, cheerleaders up the front to lead us in our favourite Pawan Kalyan chants as everyone pushed and shoved their way in and plenty of whistles and cheers meant a great start to another adventure without subtitles. It’s a novelty to watch a Southern remake of a Hindi film since so often the shoe is on the other foot and after Osthe in Tamil, Gabbar Singh is the Telugu version of Dabangg. The film follows the same basic plot, but many of the other roles have been limited to allow more focus on Pawan Kalyan’s character. It’s his film the whole way through and while he has the charisma and capability to carry it off, the story loses much of its focus by dropping the back stories of Gabbar Singh’s wastrel brother and the conflicts within their family. We start with young Venkat Ratnam Naidu and his stormy relationship with his adopted father Naidu (Nagineedu) who had married Venkat’s mother Suhasini after she was widowed. Naidu prefers his own son and makes no secret of the fact which gives Venkat a huge chip on his shoulder and a somewhat argumentative personality. Venkat ends up running away from his family, but returns years later as a police officer with the assumed name of his childhood hero, Sholay’s Gabbar Singh. He returns in style, renaming the police station after himself and single-handedly annihilating a gang of bank robbers after chasing after them on horseback so it seems safe to say that he’s not mellowed in the intervening years. It’s not long before Gabbar Singh clashes heads with local rowdy Sidappa Naidu (Abimanyu Singh) and the feud between the two forms the plot for the rest of the film. In between all the gunfights and general mayhem, Gabbar Singh falls in love with Bhagya Lakshmi (Shruti Hassan) but her role is even more reduced than that of Rajo in Dabangg and Bhagya only appears briefly in a few scenes and a couple of dance numbers. Her friend, ably played by Gayatri, has almost as much screen time and judging by the audience reaction, seems to get the better lines too. Kota Srinivasa Rao pops up as Bhagya’s father but again the role has very little scope and he barely has any input. Sidappa has political aspirations and Gabbar Singh disrupts his attempts to fund his career through various robberies and corrupt deals. Sidappa’s response is to have his henchmen beat him with clubs which is rather extreme but doesn’t really have too much of an effect on his arch nemesis. Abhimanyu Singh’s Sidappa is a typical Telugu goon and doesn’t have any of the flamboyance or appeal of Sonu Sood’s Chhedi Singh so the villain of the story is rather disappointing. As too is the item song. Although Malaika and the backing dancers did their best, Kevvu Keka just isn’t as catchy as Munni Badnam. I was also very disappointed that Ajay as Gabbar Singh’s brother only made a very brief appearance since he’s one of my favourite actors and I was hoping for more from him. However the film was made totally worthwhile by a scene where Gabbar Singh forces the usual crowd of rent-a-goons to participate in a session of antakshari. This has to be the funniest piece of cinema I have seen this year and it had the crowd on their feet cheering for more! Generally the dialogue seemed to be of high quality since many of the lines had the audience applauding and both Ali and Brahmi’s comedic roles got plenty of appreciative cheers. Since I didn’t understand the dialogue I focused on the myriad of excellent details instead, such as the gun hood ornaments on Gabbar Singh’s 4WD and the incredibly happy and enthusiastic backing dancers. There is a reason why men in flak jackets are not often seen dancing and it’s a point well illustrated in the first song. Generally though the songs are good and Devi Sri Prasad’s music suits the feel of the film. 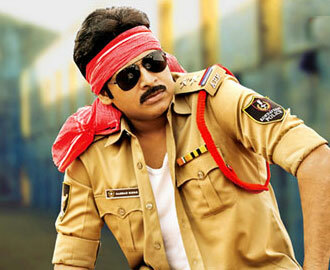 There is very little of Chubul Pandey in Pawan Kalyan’s Gabbar Singh. None of the mannerisms are there, although Gabbar Singh has plenty of the same chutzpah. The sunglass tricks are reserved for Brahmi apart from an opening scene where Gabbar Singh tosses his sunnies onto a colleagues face with impressive accuracy. There are a few moments in one song in Switzerland where the normally smooth and co-ordinated Pawan Kalyan does seem to be channelling Salman Khan’s dance style, but thankfully not for long. I did feel sorry for Shruti Hassan dancing in the snow in sandals though. The reason that Dabangg was such a hit was that it was a Southern style film incorporating plenty of the masala elements which have sadly been missing in Bollywood for some time with a hero who suited the part. Once that novelty element is removed and the film changed to a Southern locale and hero, the story is similar to most other Telugu films. The impact is further lessened by the South’s familiarity with the use of machetes, 4WD’s that roam in packs and acrobatic fight scenes and so Gabbar Singh doesn’t stand out in the same way as Dabangg, although it is more successful than Osthe. Harish Shankar has changed the screenplay to make the film suit his leading man and Pawan Kalyan is excellent as the unorthodox police officer in a rather more orthodox story. Gabbar Singh is still well worth a watch for his performance and I’ll definitely be looking out for the DVD to finally understand the dialogues and for that brilliant antakshari scene! This entry was posted in Tollywood and tagged Abhimanyu Singh, Adventures without subtitles, Ajay, Ali, Brahmi!, Devi Sri Prasad, Gabbar Singh, Gayatri, Harish Shankar, Kota Srinivasa Rao, Malaika Arora, Nagineedu, Pawan Kalyan, Shruti Hassan, Suhasini, Tanikella Bharani, Telugu. Bookmark the permalink. Did you enjoy it just as much the second time around? I can’t wait to get the DVD so that I can see the antakshari scene again – sheer genius!